Vienna, Va.— The Network of Employers for Traffic Safety (NETS) today kicked off its 2016 Drive Safely Work Week™ campaign, celebrating the 20th anniversary of the annual safe-driving initiative targeted to employers. More than 2500 organizations representing approximately 13 million employees are set to take part in the week that promotes safe-driving education and awareness to all employees—company drivers and commuters alike. The campaign comes on the heels of the announcement by the National Highway Traffic Safety Administration that traffic fatalities in 2015 increased 7.2% over the previous year, the greatest percentage increase in 50 years. Motor vehicle-related incidents remain the leading cause of workplace fatalities in the United States and are responsible for 1.6 million lost work days per year, with 90% attributed to traffic crashes that occur off the job. 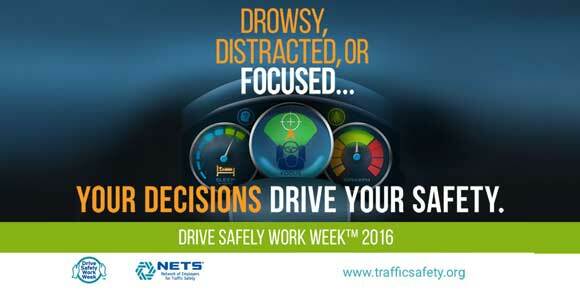 This year’s campaign is themed “Drowsy, Distracted or Focused—Your Decisions Drive Your Safety.” It calls on drivers to take a hard look at what they do behind the wheel, or before getting behind the wheel, that could be increasing their risk of a crash, starting with the significance of being well-rested. The issues of drowsy driving, distracted driving, speeding and the importance of wearing a seat belt on every trip are emphasized. NETS makes available a free toolkit that includes an interactive driver-risk assessment, graphics, social media posts, PowerPoint presentations and more that may be downloaded at: www.trafficsafety.org. Campaign materials are not dated so organizations can use them at any time throughout the year. NETS is a 501(c) 3 employer-led organization, a partnership between the U.S. federal government and the private sector. NETS’ mission is to reduce road-related collisions, injuries, deaths and costs. Established in 1989, NETS’ programs and services are dedicated to improving the safety of employees, their families, and members of the communities where they live and work by preventing traffic crashes that occur on-and-off the job. Board member companies include Abbott, AmeriFleet Transportation, Chubb Group of Insurance Companies, The Coca-Cola Company, Hess Corporation, Johnson & Johnson, Liberty Mutual Insurance Group, Monsanto Company, Nationwide Mutual Insurance Group, Shell International Petroleum Company B.V. and UPS. In addition, the National Highway Traffic Safety Administration (NHTSA) and the National Institute for Occupational Safety and Health (NIOSH) serve as federal liaisons to the NETS board of directors.